In the business world, a vendor agreement is an all-important contract that determines whether a business will have the products and items needed for the business to run. A business owner wants to have a vendor contract that will ensure that the business gets all the deliverables (goods and services) it needs to run successfully. There are a few terms that business owners should pay attention to in the vendor contract including terms that will secure the business’ proprietary information and ensure that the items and services that are being contracting around arrive in time. A vendor contract is a legal agreement that contemplates the provisions of and conditions of the work that is to be performed or delivered by the vendor. Some important aspects of the vendor contract are the date, time and location where the services or goods will be delivered. For a contract that purely contemplates the delivery of goods, the contract should include a term on exactly what is being delivered. The goods should contemplate amount and price. Similarly, these terms should include what substitutes are acceptable include the goods contracted around are not available. 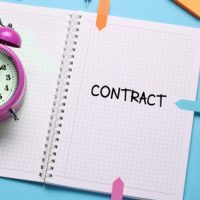 On the services side, the vendor contract should include a Statement of Work. The Statement of Work is a document that describes the work requirements of the services to be provided and lays out the expectations. The purpose of the Statement of Work is to define the liabilities and obligations between the parties to the contract. Every business has trade secrets and proprietary information that they want to guard. These business secrets need protection to ensure that business is able to compete. Given the need to guard such information, vendor contracts should include a supplementary nondisclosure agreement. This is especially the case where the delivery of services or goods requires the revealing of confidential business information. The agreement requires the signatory to treat specific information as a trade secret. It is important to note that a nondisclosure agreement will not protect trade secrets if the owner has not taken steps to keep such information secret. One of the other most important terms in a vendor contract is the delivery terms. These terms should chronicle the manner and time of delivery as well as the course of action to be taken in case the product or service is not available. This term should include details on which substitutes are permissible and the steps to be taken should a delivery become unavailable. With this term, businesses and vendors have preexisting guidelines for when things do not go exactly as planned. Hiring an attorney for your business vendor contracts ensures that you have a legal advantage. If a dispute arises, an experienced and knowledgeable attorney can guide you through your options and keep you informed of your rights. Attorney Brendan A. Sweeney is a business law attorney with years of experience advising on vendor contract issues. Contact us for a consultation.